If you got a chance of a life-time will you take the risk of riding the longest zip line? What if you got tired holding it? 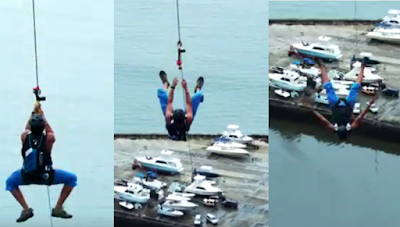 In Panama, you can find the largest urban zipline. It requires riders to BASE jump off of it after four seconds. This is to avoid crashing while landing at the end of the 2,000-foot cable wire. The end of the wire is attached to a car. The line is connected to an 800-foot skyscraper. When you take a ride on this you will see the highway and the marina. A dare-devil tries to capture this exhilarating ride using a helicam, helmet cams and cameras attached to different buildings. During testing, one of the junkies drops his divers sunglasses and one of them dropped a camera to the ground. You can also let go at the middle of the ride, provided that you have a parachute. This gives more adrenaline when riding this zipline. In the video below, cinematographer Devin Graham, also called as Devin SuperTramp, took four months to set-up this heart-pumping three minute video. Also he shared his dream when he was just a kid in film making. He said “Ever since I was a little kid, I was borrowing my parents’ cameras to get the shot that no one else could”. The video has generated 390 million views on his site and has 2.3 million YouTube subscribers. Will you take this ride just for the sake of your hobby?